Richard Keevey served as the New Jersey state budget director and comptroller for two gubernatorial administrations. He was appointed by the president to serve as the chief financial officer for the Department of Housing and Urban Development and as the deputy undersecretary for finance in the Department of Defense, and was awarded a medal for outstanding service from the secretary of defense. He directed the Policy Research Institute for the Region at Princeton University and held senior consulting positions at Arthur Andersen and Unisys Corporation. 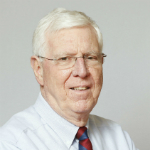 Mr. Keevey serves as vice chair of the Plainsboro planning board, and served previously as a president of his local school board and board member of the Mercer Alliance to End Homelessness. He is a fellow of the National Academy of Public Administration.